The Bund, which extends from Jinling Road in the south to the Waibaidu Bridge in the north, is a 1.5-kilometer-long boulevard on the western bank of the Huangpu River. walking along Zhongshan Road, not only can visitors enjoy the scenery of Huangpu River but have a glimpse of the development of Lujiazui district on the other side. The architecture along the Bund is unanimously honored as a "World Architectural Fair", including all kinds of tall buildings like the Gothic style, Baroque style, Roman style, Classical style, Renaissance style and the combination of Chinese and Western style. It is a romantic place for lovers. Being 1700 meters long, the Lover&apos;s Wall is a box-structure wall with reviewing stand built above to prevent the flood. The reviewing stand was paved with 140 thousand colored bricks and granite stone with 32 semi-circled reviewing balconies facing the Huangpu River, 64 squared lights along those balconies. The reviewing stand is arranged with 21 bowl-shaped flower terraces, square or six-angled pavilions and stone benches of all shapes. The quintessence of the Bund is architecture lined up along the Bund, the so-called "World Architectural Fair". There are well-known Bank of China Building, the Peace Hotel, Customs Building and HSBC Bank Building. Those buildings are harmonious both in architecture colors and skyline. No matter it is a far look or a stroll between the buildings, you can feel its grandeur, elegant and dignified bearing. Recommended visiting time is at night with the lights on. 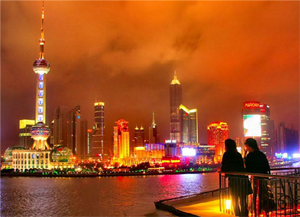 A night walk along the Bund is a great way to enjoy the spectacular Shanghai nightscape. 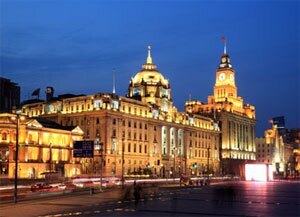 Evaluation: being the most imposing spectacle in Shanghai, the Bund has been seen as the embodiment of Shanghai for a long time.